I have a new favorite t-shirt pattern, and guess what? It’s a FREE pattern! Yay! A friend of mine kept telling me she loved the Deer & Doe Plantain T-Shirt, but it took me so long to try it. Now that I have, though, I see what she was talking about. 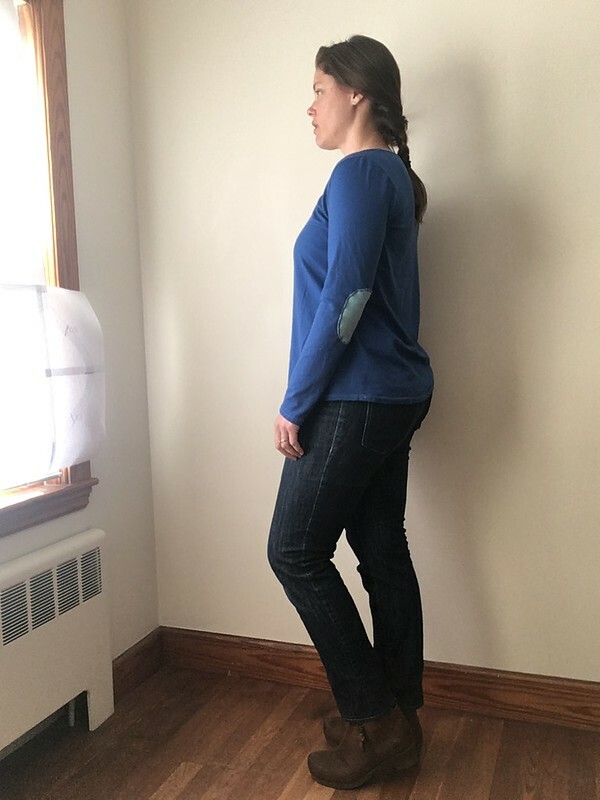 This T has a scoop neck and is fitted in the shoulders, but tapers out at the waist and hip for a body-skimming fit in those areas. 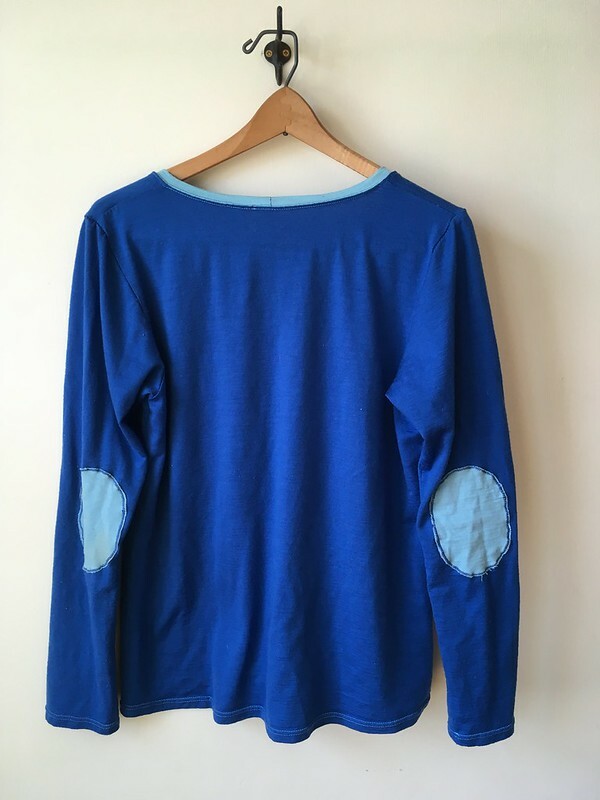 It comes with a few variations in sleeve length and optional elbow patches. I made two of these shirts and I’m excited to make more in the future. While PDF isn’t my favorite format, for a free pattern, I’m happy to make an exception. I stalled on this a bit because the few Deer & Doe patterns I’ve tried in woven fabrics cut into the front of my shoulders, something I haven’t resolved. I thought a shirt in a knit might be fine, but I just wasn’t sure. Well, I didn’t have to worry, because these turned out great. 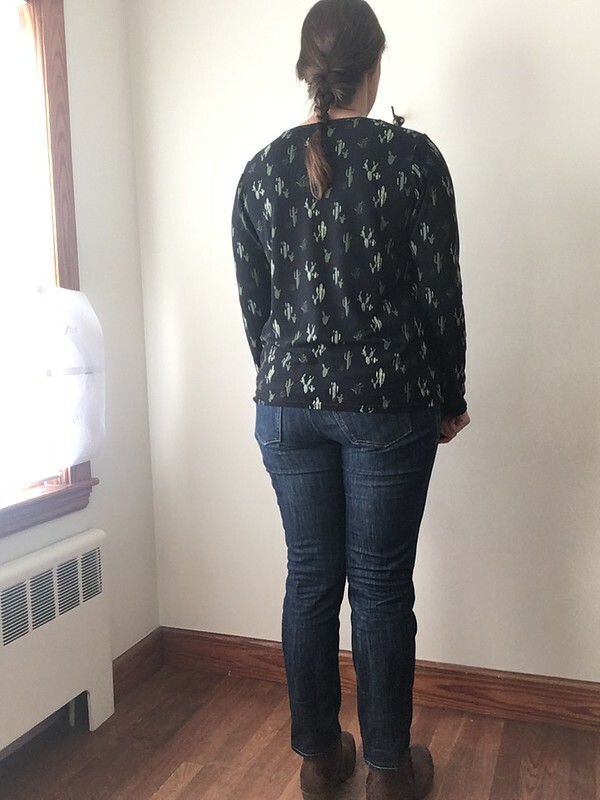 Even if whatever fitting issue I have with Deer & Doe is still present, the knit makes them really comfortable, which makes me really happy. 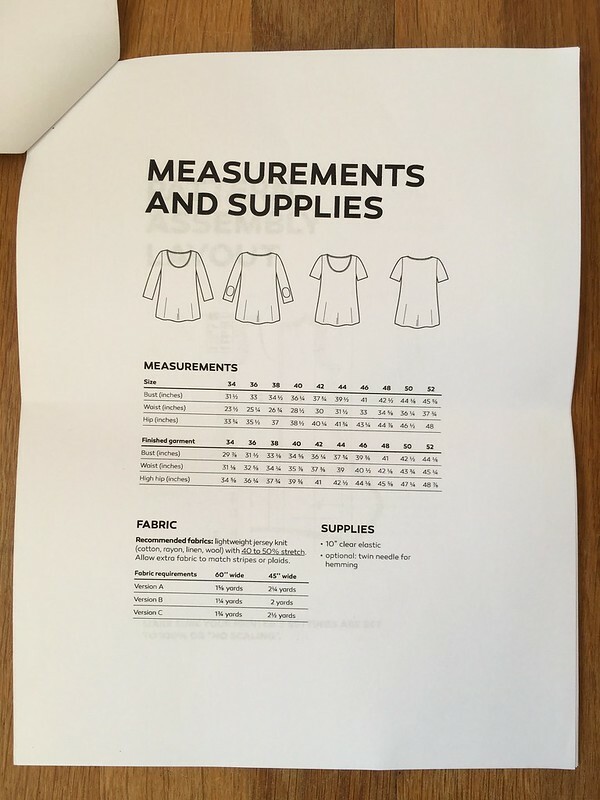 So, here are the details on the pattern and materials. 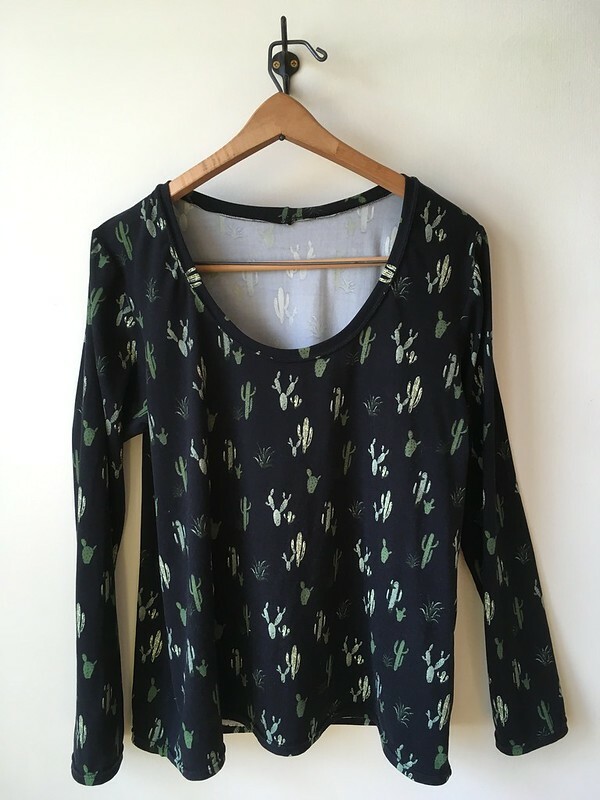 While I often love natural materials, I got sucked in by this cute cactus print and ordered some double brushed polyester knit from Cali Fabrics. (The black cactus print is currently sold out, but there is still a blue colorway.) I wasn’t sure if I would like it, but…I love it. 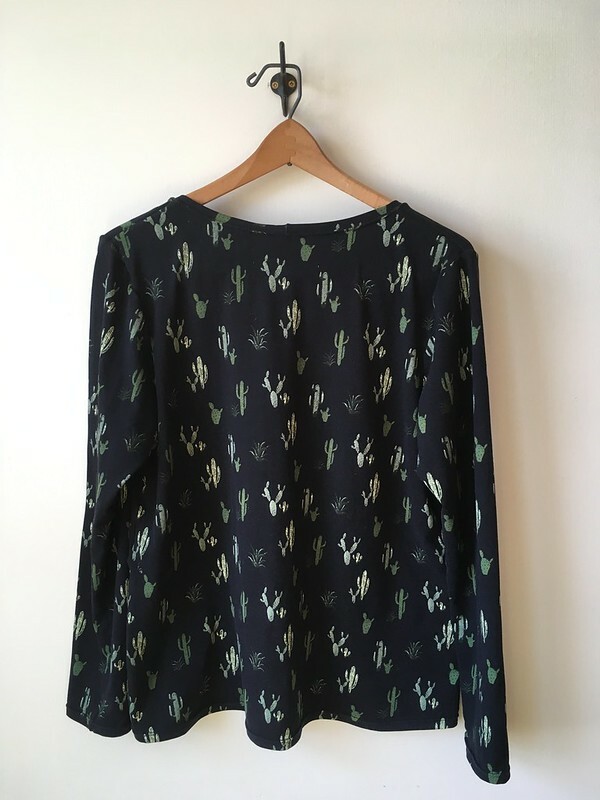 It’s really soft, and I just love those cacti! I thought it would attract a lot of hair and fuzz, but it really doesn’t. I’m glad I tried it. The other fabric I used was a merino jersey I found on sale at Fabric Mart (long since sold out). I hesitated the first time they had merino jersey, and I missed out, so when this appeared, I snapped it up. 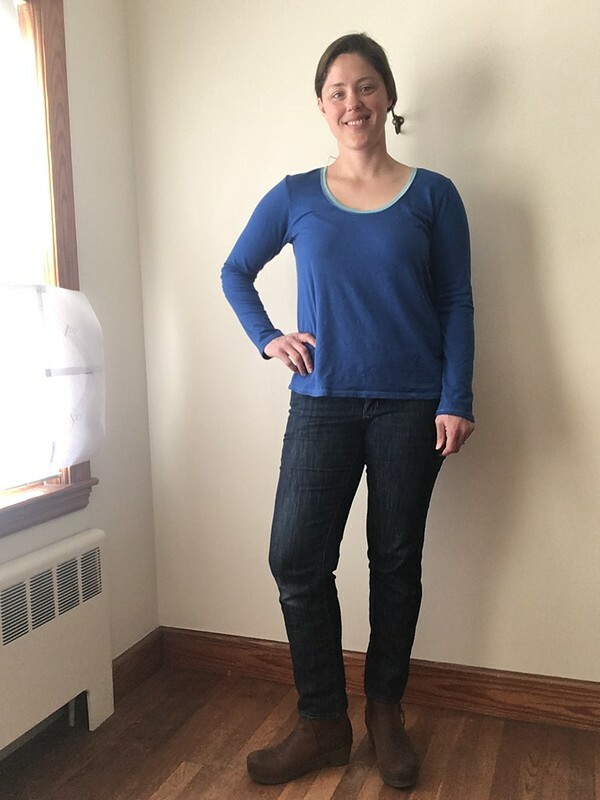 Merino was on my list of fabrics to try. I also used the scraps of light blue washable wool jersey from Fabrications I had left over from my Strathcona Henley. 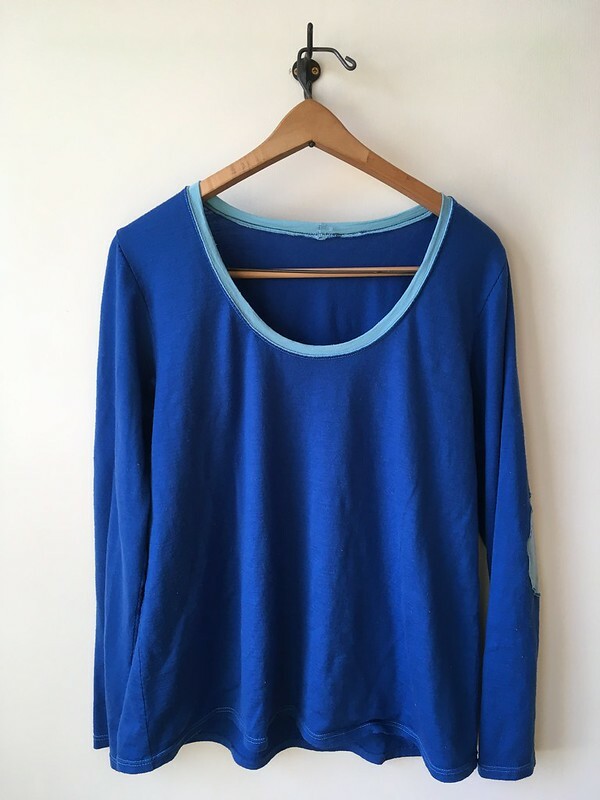 I was surprised to find that I liked the merino less that I expected to. It’s a good weight and all that, but initially when I put it on, it has that very slightly scratchy wool feel. (To be fair, Fabric Mart did say this had a “slight wool feel”.) I stop noticing it after a few minutes, but that was a surprise to me. It also tends to attract all the hair and fuzzies in the washer and dryer (yes, I wash it on cool and dry it on low a lot of times–I prewashed and dried so I could do this without fear of shrinkage). It would be interesting to be able to feel different versions of merino in person to see if that “wool feel” is typical or not. This is less of a problem with the yellow wool/Lycra ponte I used in my Strathcona Henley. While I always prefer to shop for fabric in person, it’s not always possible. Both Fabric Mart and Cali Fabrics are online shops I like for their competitive pricing, variety of choices, and sales (in the case of Fabric Mart). 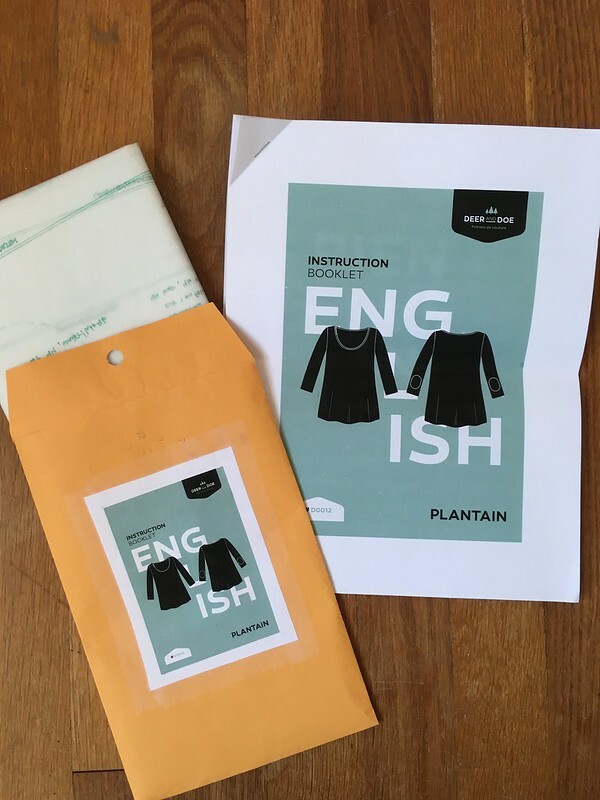 I’ve only shopped at Fabrications online once, but was very, very impressed with their customer service. 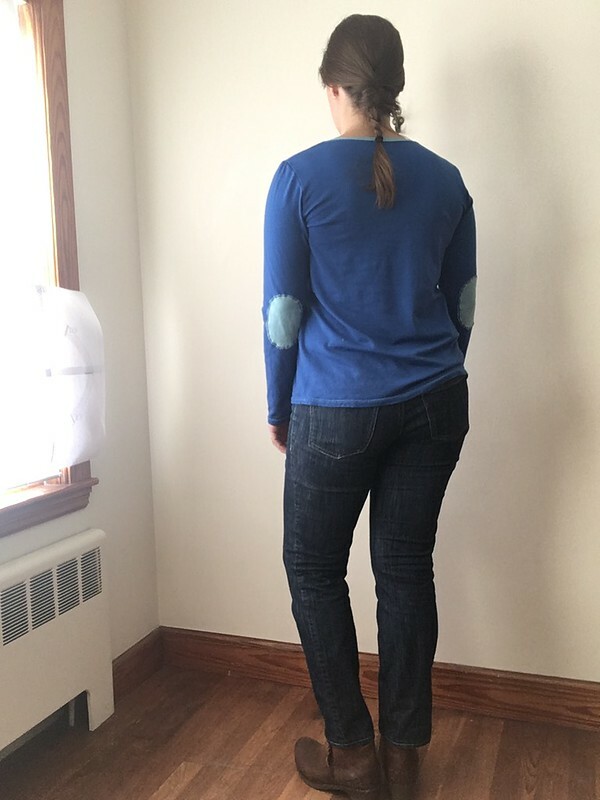 I cut a 44 in the bust and 46 in the waist and hips of Version C. I tried using Eloflex thread, the slightly stretchy thread from Coats, but it didn’t work well with these shirts. I also found that a stretch needle didn’t work well, but a 70/10 jersey needle did. I used polyester Gütermann thread in the top of my machine and woolly/bulky nylon in the bobbin. 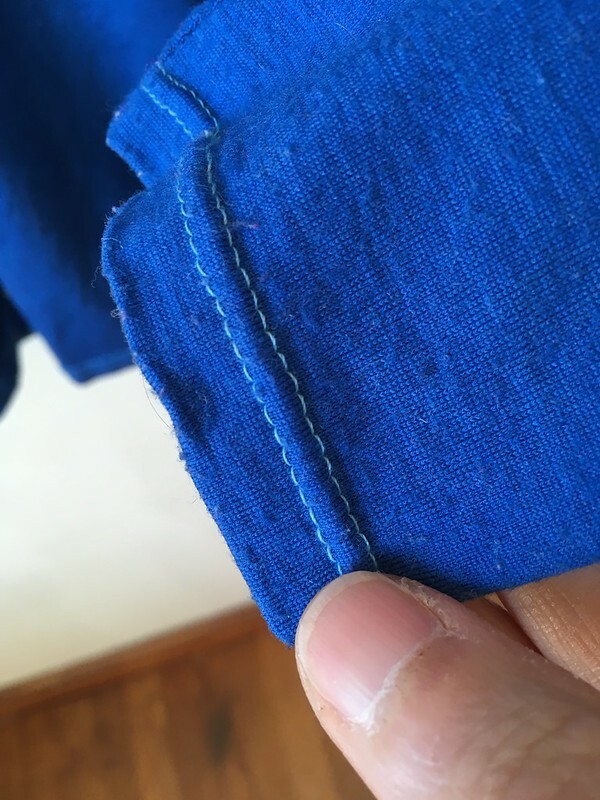 I lightened up the presser foot pressure, and used a zigzag stitch for construction and a twin needle for my hems and neckband topstitching. 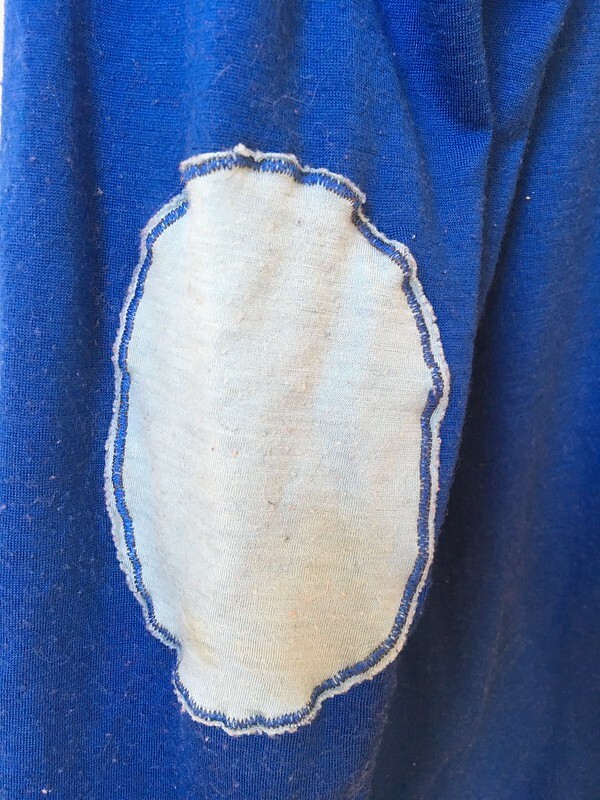 It was really fun to use some contrasting thread in these spots on my blue shirt. 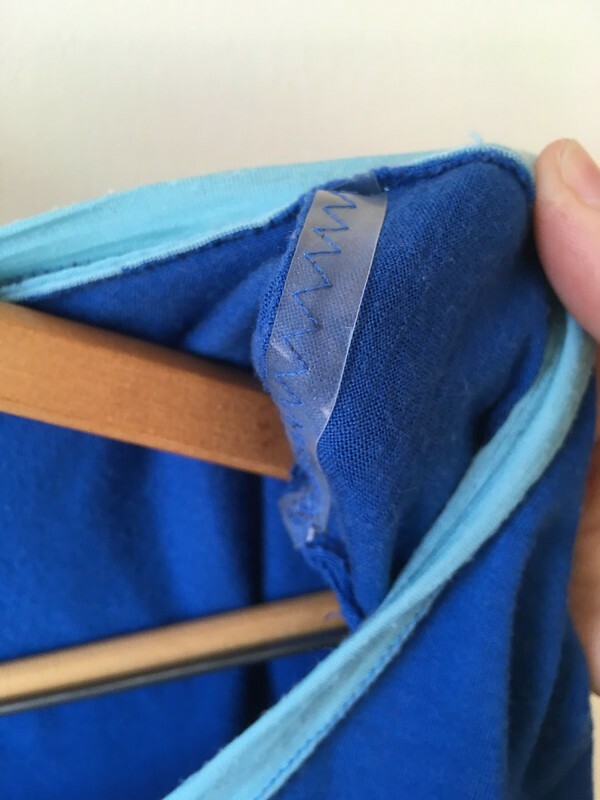 I also added clear elastic to the shoulder seams as instructed to keep them from stretching out. 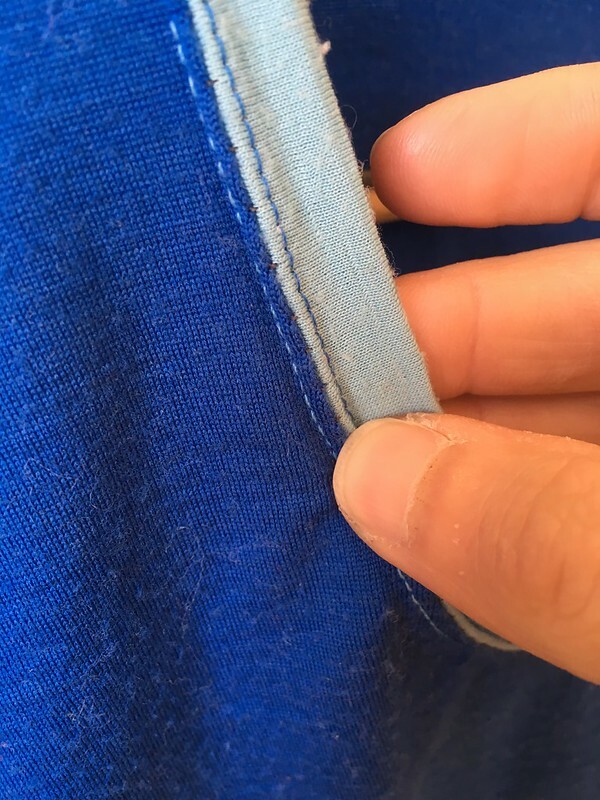 Rather than using a straight stitch to attach the elbow patches on the blue shirt, I used a zigzag stitch (so there would still be some stretch) and then went over it again with a satin stitch (a closely spaced zigzag stitch). The zigzag alone didn’t look that nice and the satin stitch alone caused tunneling. For some reason, this combination of the two was a winner. I really, really like these shirts. 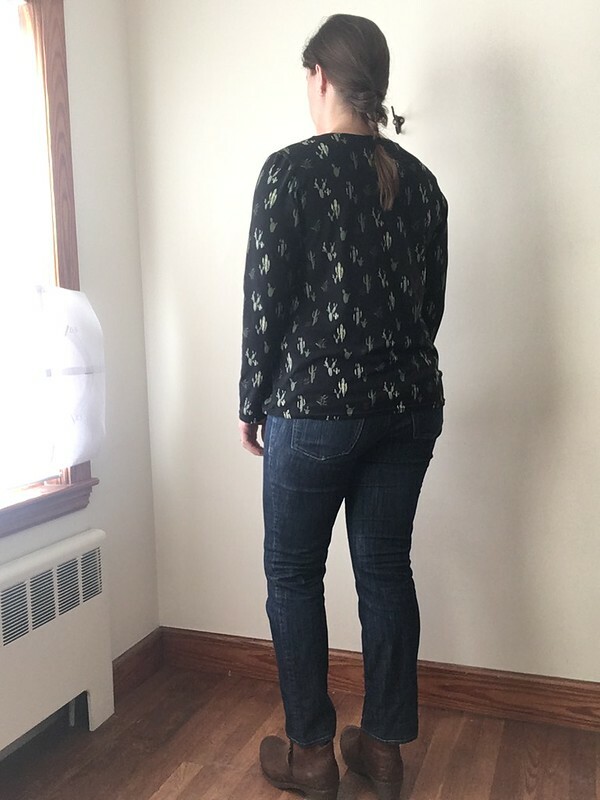 As I look at the pictures now, I can see some drag lines around the armhole, but that’s an area of fitting I haven’t really delved into yet and, in a knit, these are more than good enough–they’re great. I would love to fill my drawer with Plantains in a variety of fabrics. 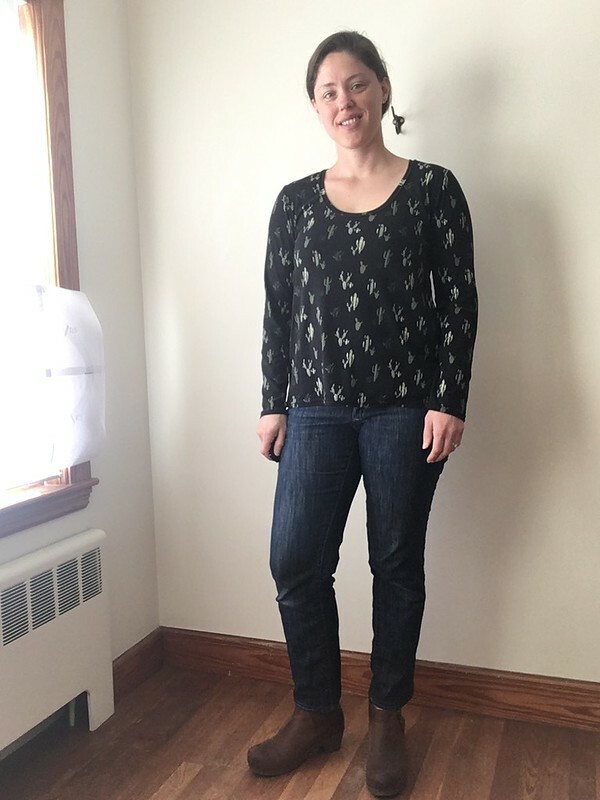 This pattern is a quick and easy sew—a real winner. I checked out The Cool Factor by Andrea Linett from the library thinking it was probably a do’s and don’ts of fashion kind of book (I’m not super into that), but that I might find a little inspiration. Well, I was wrong. It’s a GREAT book where the author rounded up her most fashionable friends and showcased their style, breaking down how they think about creating their outfits. This is definitely NOT a do’s and don’ts book. It was really fun and inspirational, and it got me thinking that fashion is a kind of everyday art anyone can participate in if they want to. Unless you’re a nudist, we all have to get dressed. I found inspiration even from looks that are very different from what I would wear myself. Now I have new ideas and types of clothes I want to try. Find me on Instagram and Pinterest! Erica Bunker | D.I.Y. Style! © Lisa Poblenz and Pattern and Branch, 2019. Unauthorized use and/or duplication of this material without express and written permission from this site’s author and/or owner is strictly prohibited. 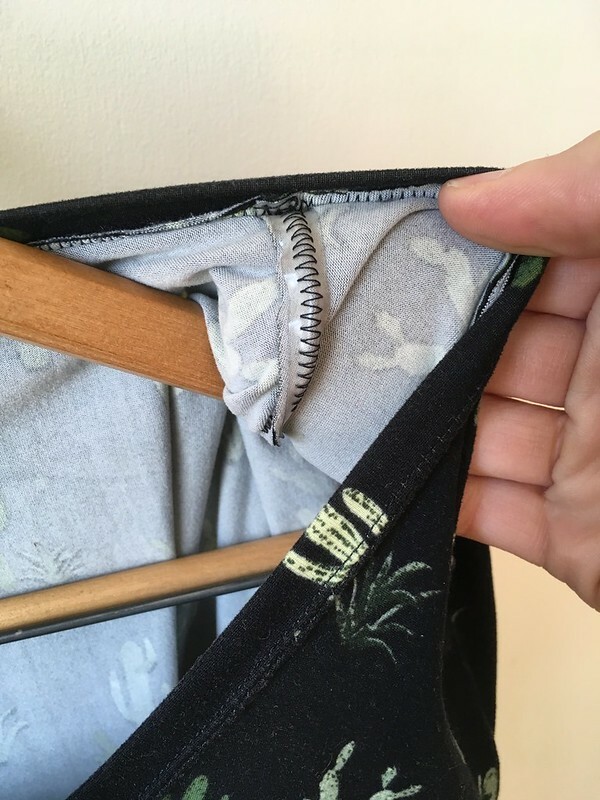 Excerpts and links may be used, provided that full and clear credit is given to Lisa Poblenz and Pattern and Branch with appropriate and specific direction to the original content. Please do not reblog this content without permission.